ORGANIC food can be made accessible and affordable to more of society, says a pioneering co-operative of vegetable and meat box schemes. The Riverford Organic box scheme started when Guy Watson started delivering them to 30 friends around Devon and now 40,000 boxes are delivered weekly to homes around the UK from their regional farms. Meat boxes have been added to the variety of produce sourced and the co-operative only uses small-scale producers who can offer a level of care to their animals that intensive producers can’t. Speaking on a You Tube clip on Riverford’s site, Mr Watson said: “The challenge of a vegetable box scheme is that you need a huge range of vegetables to keep the boxes interesting all year, so we grow 100 different types of vegetable from the humble suede and potato to basil and coriander, chives to strawberries and rocket and loads of different oriental salads. There are so many different crops. “It is really important to our co-op members to know that what they are producing is somebody who is going to value it at the end of the day. You get people who say that really tasted good and they want to come and look round the farm, get excited and really interested – it just makes the whole thing seem so much more interesting and worthwhile. “A few years ago I speaking to a conventional farmer on the Fens who was growing conventional lettuces for the supermarkets and I bent down to pick a bit of escarole and he said ‘shouldn’t do that boy’ because of course it has been sprayed. They spray every week for aphids. This is a farmer who was growing food who wouldn’t eat his own food. Intuitively anyone knows that’s crazy. Food should be fit to eat out in the field. “Normally it is no more than two days from the field to the doorstep. Mr Watson also alleges that he knows of agricultural workers who help produce conventional produce for supermarkets yet run their own vegetable patches at home in the much the same way as an allot ment holder. Riverford Organic don’t just do veggie boxes but also veg and meat boxes; fruit boxes; salad boxes in mini, small, medium and large sizes. In an exclusive interview with this blog at the New Forest Show, Mark Hallam of the Southampton-based franchise, claims that two years of research conducted by the University of Exeter found that one kilogram of tomatoes picked in the hot houses grown over here, would generate two or three kilograms of carbon dioxide, more than the amount used to ship tomatoes grown from Spain. 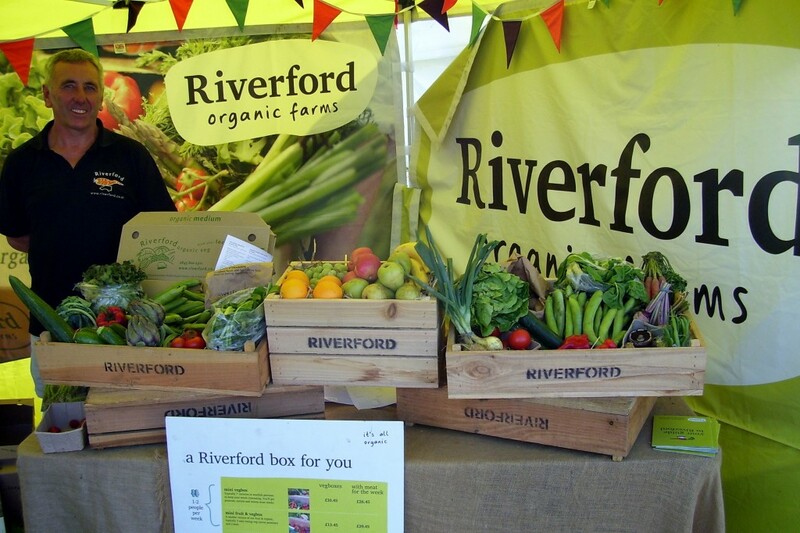 He said: “Riverford have a network of vegetable growers around the country who are Soil Association registered. We are doing meat boxes now. All our meat originates in the UK. We don’t need to import it. “For the vegetables, we are running about 30 per cent cheaper than the supermarkets. There is very little organic land in this country and supermarkets are unable to get enough fresh, organic food. “The vegetable boxes are really good value and you don’t have to commit to so many deliveries, or you can do just one delivery and never have another. “We also do meat, dairy, bread and wine. We’re quite an ethical company and meet the RSPCA’s standards on animal welfare and won the Observer business award. “Exeter University carried out a study on the effect of carbon commissions in this country. It found the tomatoes here are grown in heated polytunnels and the season is very short and the emissions were greater than growing them in Spain and bringing them here via lorry. “The scheme came about due to the way supermarkets were treating small farmers and businesses. The box scheme came about through small farms each doing farm deliveries in their own area. THE Dorset Franchise has had successive years of growth in delivery numbers. The area in Dorset is mainly rural but incorporates the large urban conurbations of Weymouth, Dorchester and Blandford. It has been successful getting its message out through word of mouth, recommendation and local shows. For more information, call 01803 762015.